Single length construction ensures all possible elements of swing feel are identical for each club in the set – same MOI, same total weight, same headweight, same balance point –to offer the chance for improved shot consistency. Identical length and lie allow the golfer to use the same stance, same posture, same swing plane for improved shot consistency. High COR #4, 5, 6, and 7 irons offer proper distance for the low loft clubs at the shorter single length. Other single length sets may lose distance with the low loft clubs. Conventional cast carbon steel in the #8 thru the wedges with 5* loft increments blend with the high COR design of the low loft clubheads to offer proper distance gaps and proper distance with the high loft clubs. Other single length sets may generate too much distance with the high loft clubs. Available in a #4 iron, #5 iron to match the player’s desire and ability, with #6 to 9, PW, Gap, Sand and Lob Wedge. Sterling Irons® Single Length clubs can be built to 36.5”, 36.75 or 37” length for each club as fit by the Clubmaker for the golfer’s comfort and preference. Contrasts with most other single length sets being created for a 37.5” length – which can generate too much distance with the high loft irons. Available in: #4 to 9, PW, Gap, Sand and Lob Wedge. All Prices are: CDN. funds, taxes in, f.o.b Woodstock, Ontario, Canada. The concept of making each iron in a set the same length is not new. Eric Cook’s Iso-Vibe Golf Company in Canada began offering single length sets of irons to the North American golf market in 1986. 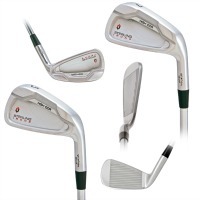 Perhaps the best known introduction of a single length set of golf clubs was the former Tommy Armour Golf Company’s release of their EQL single length woods and irons in 1989. Since that time, a handful of lesser known, under-marketed companies have offered single length sets of irons, mainly through an on line direct-to-golfer offering. The concept of single length irons received a huge boost in general awareness from the publicity of amateur golfer Bryson deChambeau’s victories in both the USA National Collegiate Athletic Association (NCAA) and US Amateur championships in 2015 using a single length set of irons. Bryson deChambeau became only the 5th player to achieve this very prestigious amateur championship “double” in the same year, something that had only been done by Jack Nicklaus, Phil Mickelson, Tiger Woods and Ryan Moore. SPECIAL NOTE: JULY 16TH, 2017. BRYSON deCHAMBEAU HAS JUST WON THE JOHN DEERE CLASSIC. All of a sudden a larger number of golfers are becoming aware of single length irons and with it, a serious level of curiosity whether a Single Length set could be a viable change to make in their own equipment. As is the case with any new and different golf equipment concept that gains awareness and attention, there are a lot of questions as well as a bit of misinformation and misunderstanding concerning single length sets of irons. As the leader in golf equipment performance research, Tom Wishon Golf Technology is pleased to once again offer the most truthful, factual and understandable information to help golfers understand the concept of Single Length set design. What is the Reason a Golfer Might Consider Making a Change from Normal Incremental Length Irons to Single Length Set of Sterling Irons? The technical basis behind the creation of a set of single length sterling irons is to say that if all the clubs have the same length, the same total weight, the same headweight, and the same balance point it will enable the golfer to use the same stance, posture, spine angle, swing plane – the same everything in the swing. As such, the single length approach has a chance to offer a higher level of swing repeatability and shot consistency for each of the clubs in the set. At the same time, it must be said that many golfers have achieved very good swing and shot consistency using irons built to normal incremental lengths which are very accurately custom fit to their size, strength, athletic ability and swing characteristics. However, if a golfer has suffered from chronic or occasional shot inconsistency, converting to a single length concept could offer some help. The biggest reason you need a special set of club heads for single-length irons is the weight of the heads. If you bought a conventional set of club heads with their conventional 7 gram weight differences between heads, and built a single-length set from them, the swing weight would be all over the place. This would defeat the purpose of one feel and one swing for all your irons. So if you want to build a single-length set, you are going to need heads designed specifically for this purpose. 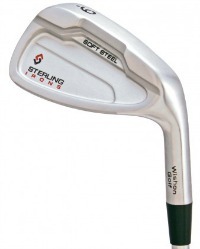 Wishon Sterling Irons are all 274 grams in weight which is usually the weight of an eight iron head. In addition, with the unique Wishon hosel weight port, we can add additional weight to all heads in order to achieve uniform swingweights, at different club lengths. With adding identical shafts in weight and flex and identical grips, you have a perfectly matched set of irons, with their identical swingweights. With this mid-range head weight, and by adding additional head weights, lengths can be built to 36.5”, 36.75”, 37” or 37.5”. The bodies of the irons and their hosels are soft carbon steel, so customization by bending is easy, and offer a greater range for loft and lie than other single-length irons. The advantage of Sterling Irons is the ability of their heads to fill in your carry distances and to keep your set range, the same as your previous conventional set. Below is a chart showing typical yardage gaps for a set of conventional irons with their ½” spreads, and a set of single length irons with the length of all irons being the 7 iron length of 37 inches. This is crucial to understanding an important difference between conventional and single-length irons. The only thing that we have held the same between the two sets is the loft lineup; both sets have the same loft in all the corresponding clubs, a 4° loft from club to club. The carry distances of the single length set have to be changed in order to lengthen the distance between the lower irons and shorten the distances on your upper irons. How do we do this-I am glad you asked-READ ON. Thanks to Dave Tutelman for this chart ! The range of any set of irons is the difference in carry distance between the longest-hitting and shortest-hitting clubs. This is usually around 90 to 100 yards from your 3 iron to pitching wedge. It's the range of carry yardages you can cover with a full swing. The difference in carry distance from club to club is based on two important variables: loft and club head speed. Higher club head speed gives greater distance, and, for a properly-designed and built set of conventional irons, a longer club delivers greater club head speed, which gives greater carry distance. A set of single length irons will give you the same club head speed so therefore you must have proper loft increments to achieve the proper GAP between clubs in order to get your carry distances to fit the Range of your iron set to match your previous conventional set. You need a spread of carry distances that each iron will travel. When a custom club fitter bends the lofts to create that pattern, the process is called "gapping"; it generates a set of yardage gaps from each iron to the next. If you hope to improve your scoring with a single-length set, pay particular attention to the yardage gap pattern. A poor set of yardage gaps for your game will hurt your scoring at least as much as a single swing would help. Wishon’s Sterling Irons have some innovative technology involved to make the gaps work. He chose a 4° loft split for the 4,5,6, & 7 irons and a 5° loft split for the 8, 9, PW, GW, SW, LW. He also put high-COR ("hot") (.83 COR) faces of HS300 High Strength Steel on the 4-through 7-irons, giving them about five more yards of distance. His 8 thru wedges are of 8620 Carbon Steel with 5 degree loft increments to offer proper distance gaps and proper distance with the high loft irons. All this gives you a custom fitted set that can be set up for a greater Range than other single-length irons. All that remains is for you to go out and hit your sterling irons, plot your gaps, and if need be, go back to your club fitter for any necessary tweaks. The only way to ensure proper gaps (or at least as close to proper as most of us can get), is to work with a qualified fitter who can adjust each iron loft independently as needed to dial in the requisite average distance.